She would be my great great grandmother. Arthur was my great grandfather, followed, by Lyle Wulff who was my grand father. Thanks again for posting this. I need to compare more notes with you, but it looks like you are more involved than I am. Also my brother has all the notes I had on this stuff. But I know I had traced my roots back into the Bohnhoff’s as well. Please feel free to contact me if you’d like. I am Donna Bohnhoff. 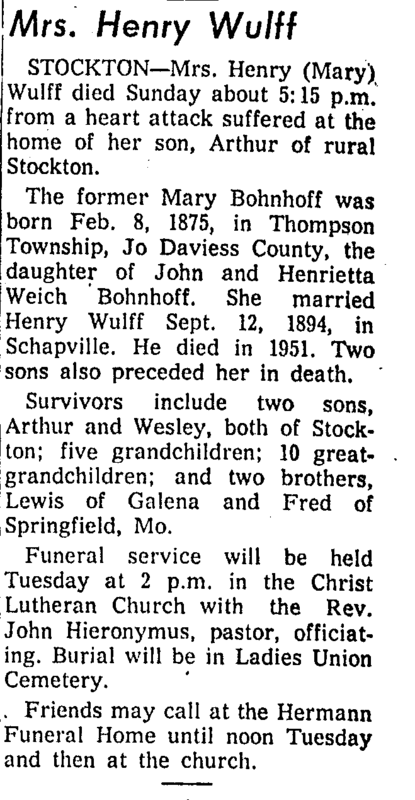 Louis Bohnhoff from Galena was my grandfather and Anna was his wife. I have alot of information on the Wulff’s, you can contact me.